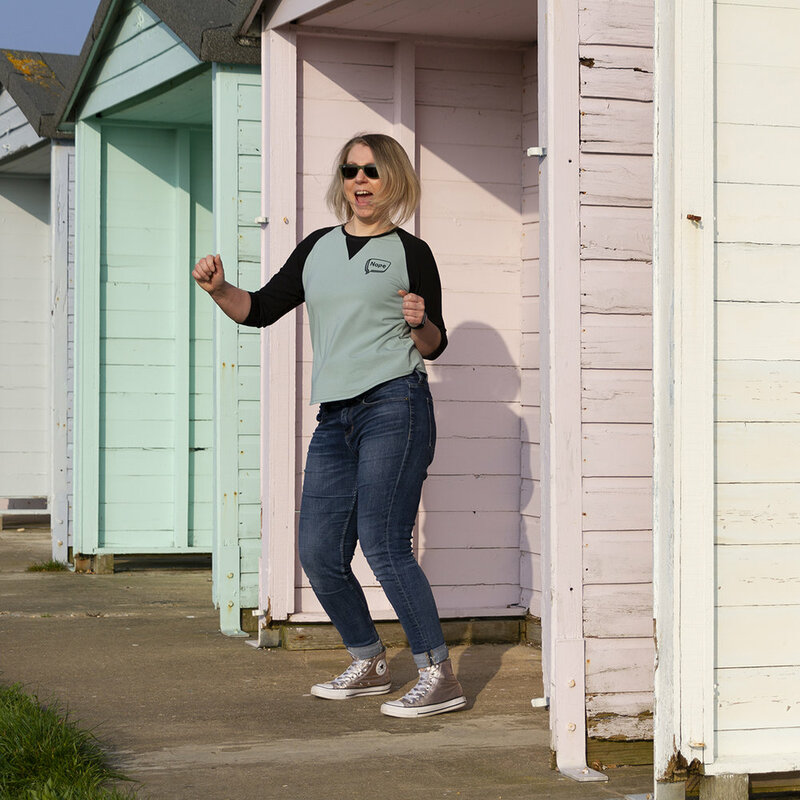 The Frankie baseball tee by Tilly & the Buttons. Frankie, that terrible Sister Sledge song (google it, it really was them)! I’m probably showing my age here, but I remember when the song charted. My older sister and cousin would sing along loudly, while I would fall about in fits of laughter because my dad’s name is Frank and as a five year old it’s always funny to call your parents by their real name! I can’t say that it helped much that my mum hated the song with a passion and would get so annoyed; for some reason that just made it all the funnier. Fast forward 30(ish) years and that song now plays in my head every time I think of the Frankie tee by Tilly & the Buttons. 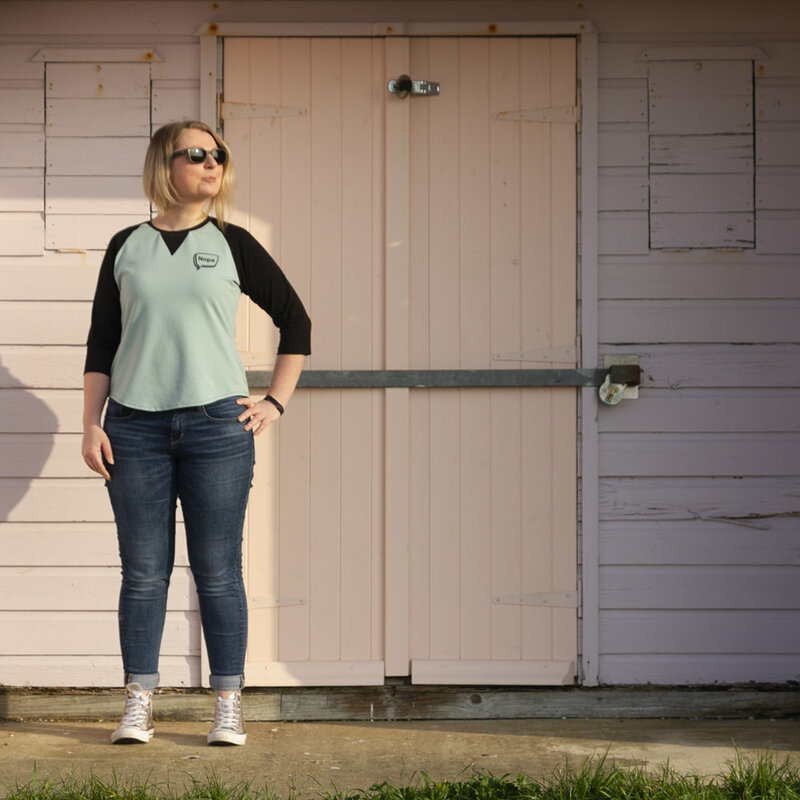 I wanted to improve my jersey sewing skills and make a few more casual t-shirts, and the Frankie sits in that middle ground between ‘comfy and loose’, and ‘shapely and fitted’. Plus, the raglan sleeve and neckband means the Frankie can be brilliantly colour blocked – so the style opportunities are endless! The pattern is available in Tilly’s book ‘Stretch’ and, as is usual with T&TB’s patterns, was super easy to make. I cut a straight size 4 with ¾ length sleeves, the only adjustment being that I shortened the bodice by 50mm as I knew from looking at the promo pics it would be too long. One of the great things about this pattern is that by mixing up colours and patterns you can use up quite small quantities of fabric – especially if you cut the short sleeve version. Sewing the neckband is the trickiest part of the whole process, and Tilly guides you through it fairly well but is honest enough to say it might not work and you might have to get that ‘unpicker’ out and try again. The first neckband went in with no problems, but I managed to stretch out the band on the pink version. I unpicked, steamed the hell out of it until it was flat again, trimmed off approximately 1cm from the length and it went in just fine the second time around. It’s taken me a couple of weeks to upload this post as I’ve been waiting for a clear and sunny early morning so I could capture these two makes in front of the beach huts down on the seafront - the colour matching was completely by accident, but I couldn’t pass up the opportunity for an ‘on location’ photo-shoot that co-ordinated so well! The pink jersey is from Sewalicious – I love the 80s vibe to this fabric, and I thought the black triangle pattern would look great with black sleeves. It has quite a good stretch to it but with a strong snap back too. The minty green (which I feel is incorrectly described as ‘dusty light green’) and the black jersey are both from Stoff and Stil and are from their mid-range jerseys. They feel like a good quality; a nice weight, with a soft handle. I added the ‘designed by me’ flocked HTV ‘nope’ logo to the minty version as I wanted a t shirt for those days when nope just sums everything up – it’s one of my favourite words to use in place of a whole sentence!